Give Yourself The Gift Of Gifted! Disclaimer: I was invited to attend this screening as media. All opinions as always are honest and solely mine. On my quest to #LoveMe I’m sticking with doing something at least once a week that is just for me! Usually when I go to screenings it’s for movies that JustaBXgirl wants to see. Last week I went to see a movie that I wanted to see. That movie was Gifted starring Captain America, I mean Chris Evans and McKenna Grace. It was a happy surprise that a friend of mine I hadn’t seen in ages was also attending the screening so I had someone to discuss the movie with after. As always I don’t want to give too much of the film away because I want you to go see it and make your own judgments. I have to share however how amazing I found the cast to be. We know that Chris Evans can be a superhero but watching him in this role was very different. He did an amazing job in his role as uncle. I really believed him as struggling to find his place as Mary’s (Mckenna Grace) guardian. Even before his mother came into the picture to complicate his custody arrangement you could sense the complication happening. For all intents and purposes Frank (Chris Evans) was a single parent dealing with the stresses that come with that role. You can see him wondering if he was making the best decisions. You could see him trying to balance meeting Mary’s needs and meeting his own. Enter the fact that Mary is a true genius. Throw in that before his sister’s death she was a genius that in many ways was controlled by her mother and dealing with her own set of demons. Add in a bit of guilt for moments lost. And finally mix in a tunnel-visioned grandma. Yup, Frank and Mary’s home life was thrown for a spin. And as is known to happen that spin cycle creates a ripple that goes beyond their home. Loved how we knew from the start that while Frank was raising his niece alone he had Roberta (Octavia Spencer) as part of his village. That’s what happens when you’re a single parent. You create a village that loves and supports you and your child. It was cool to see how quickly Bonnie (Jenny Slate) became part of the village even if she had a part in why things got thrown for a loop. I think all of the actors in this movie were great but one stole the show and rightfully so. Mckenna Grace was beyond believable as Mary. Mary seemed to be not only a genius but a really cool kid. The role was written with lots of emotion and McKenna Grace served! She was fierce. Not only did she deliver her lines superbly but her facial expressions were completely on point. There were so many moments in the film where her delivery was so strong that it moved me. One scene where I think her talent blew me away wasn’t even one that was critical to the movie. It was just such a real parent/child moment that it made me cry. I can share some of it because like I said it wasn’t critical in that it would give anything away but it really made me forget for a second that I was watching a film. Mary had broken a rule that basically allowed her to find Frank in a compromising situation. While disciplining her he steps on a Lego (yup, we all know his pain). In his moment of anger and pain (literal pain from the Lego) he says something about wishing he could have 5 minutes to have a life of his own. Mary took this comment extremely personal and wore it entirely on her face. I’m sure we’ve all been there. We said something we don’t really mean in a moment of frustration and anger and our little takes it to heart. Frank knew he messed up and tried to explain it to Mary by reminding her that she had recently told him he was the worst uncle and she hated him when he told her no. The heaviness was lifted a bit when he asked if she really meant that and she said not completely. Be prepared to cry when you go see this movie. Will you cry it out like a baby? Probably not but you will definitely have your heart strings pulled. At some moment in the film you will relate to every adult in it. If you’re a parent anything like me you will relate to Frank and his struggle to make the best decisions for his charge. You will relate to Roberta because sometimes you can’t do anything to help your friend but listen. You will relate to Bonnie because sometimes you will mean well and it will not work out how you intended. You will even relate to grandma Evelyn (Lindsay Duncan). Evelyn is another just trying to do her best and living in her truth. My two favorite scenes with Evelyn are first when she’s on stand in the courtroom and second at the end of the movie when she’s confronted with a new truth. Octavia Spencer as “Roberta” and Chris Evans as “Frank” in the film GIFTED. Photo by Wilson Webb. © 2017 Twentieth Century Fox Film Corporation All Rights Reserved. At the end of the day the adults in the film just wants what’s best for Mary. The thing is though how do any of us know if we really know what’s best for our children? I mean, is there any parent that doesn’t want the best for their child? I didn’t think so. Yet, every day we question ourselves and if we are making the best choices. There was a lot to relate to in the movie. Don’t worry though I’m sure I am making it heavier than it really is. There was lots of times I laughed in the movie as well. 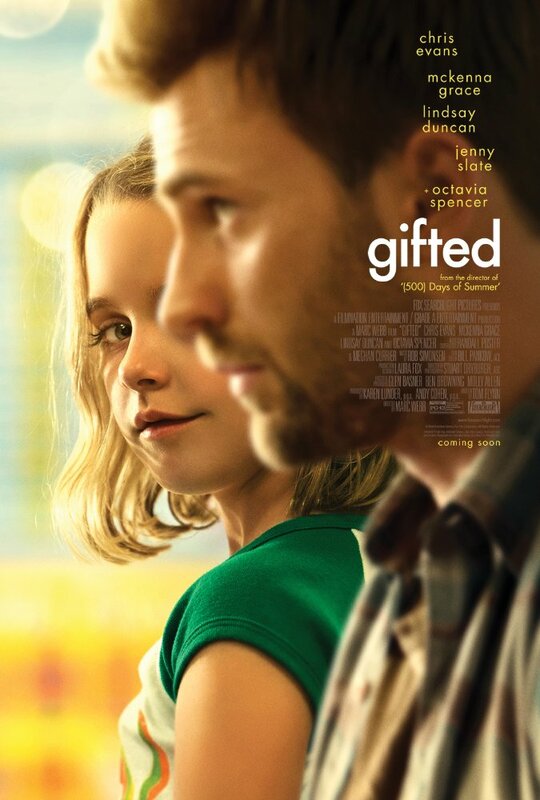 Mckenna Grace as “Mary” in the film GIFTED. Photo by Wilson Webb. © 2017 Twentieth Century Fox Film Corporation All Rights Reserved. I will leave you with one last warning. Mary might leave you feeling dumb. I mean her own teacher had to use a calculator to see if Mary was correct with some math problems. It was a fun movie and I’m happy I went to see it. And even happier that I got to interview Chris and Mckenna over the phone after the screening. Make sure to check out those interviews on the site later this week! I am pleasantly surprised to see Chris Evans protraying a different kind of role other than a super hero character! I can’t wait to see your interviews. I think I might need to put this on my list.